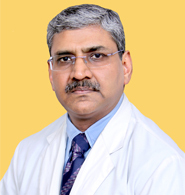 Institute of Cardiac Sciences is headed by a senior consultant with more than 22 years of clinical experience. This department started delivering services 17 years back and since then more than 13,000 procedures in Cath Lab and about 800 cardiovascular surgeries (including CABG, MVR, AVR, ASD closure) have been performed.We treat cardiovascular, thoracic and vascular diseases that include heart failure, heart defects, coronary artery disease, congenital heart disease, heart valve disease and arrhythmias. Highly qualified heart and vascular specialists utilize the most advanced techniques and innovations in heart surgery to get optimum outcomes. The institute offers high diagnostic & therapeutic capabilities to accurately detect the medical condition of the patient. This way we can provide them with best-suited therapy at the right time. Human heart works tirelessly throughout your life. It is your power bank which never pauses to rest. Heart diseases have increased rapidly in the recent years and show warning signs similar to other medical conditions like chest pain, shortness of breath, heaviness & burning sensation in chest, palpitations, nausea, weakness, fatigue, sweating and pain in shoulders or arms. One should never take these danger signs lightly and immediately consult your doctor for diagnosis & treatment. The Department of Cardiac Sciences at Jaipur Golden Hospital provides advanced and comprehensive care to patients with routine heart problems to the most complex and rare ones. Jaipur Golden Hospital has successfully achieved enhanced outcomes in this department as we have been able to provide improved quality of lives to thousands of cardiac patients visiting us every year.